The first elephant calf to be born in Australia has been blessed for good health and success during a traditional Buddhist ceremony in Sydney. 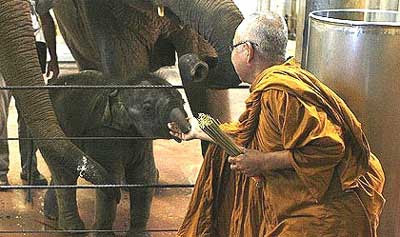 Taronga Zoo's six-week-old Asian elephant calf, Luk Chai, which means son or male child in Thai, received prayers then had water sprinkled over him by monks on Saturday morning. The blessing was led by senior monk Pra Ratcha Silaporn from Wat Buddharangsee forest monastery in Leumeah with help from eight monks from temples in Sydney and Canberra. But he later warmed to the monks and wrapped his trunk around their hands as water was sprinkled over him inside his pen, under the watchful eye of his mother Thong Dee. Taronga Zoo director Guy Cooper said Luk Chai's birth gave hope for the conservation of Asian elephants and had helped forge closer ties between Australia and Thailand. "With the global response to the challenges of conservation we can only have hope for the future of wildlife," he told crowds watching the ceremonies. Luk Chai, born on July 4, is the first elephant to be successfully bred in Australia.